Molly Bather lift - can it be fitted to a corner bath? Yes it can. Can you fit a Molly Bather belt bath lift to a corner bath? Sometimes it takes a bit of ingenuity to solve a problem! Mrs E was struggling to use her corner bath. She’d had a fall and her family was nervous about her safety. They called one of the large national bath lift companies and were advised to change the bath so that a belt lift could be fitted straight across. This would have meant major disruption as all of the walls tiles and floor tiles would have had to be renewed. They were not very happy about that! Practical Bathing was introduced by a friend, and we went to take a look. The Molly Bather seemed to be the most appropriate model for the situation. It was a bit tricky as the corner bath means the lift and fixing bracket have to be at an angle, and the bath panel bulge would push the lift away from the bath rim. However, nothing is impossible! We took detailed measurements and drew up a plan so that a special wall bracket could be made. 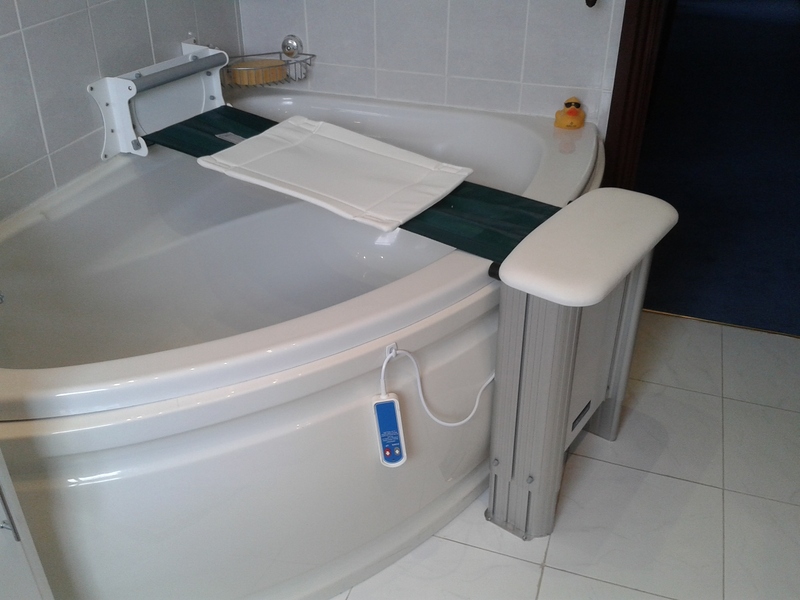 The lift was fitted with extended “bumpers” so that it would avoid the bath panel but reach the bath rim. The lift was installed very carefully to get the angles correct, and adjusted to height. It was then fully tested before demonstrating to the customer. Mr and Mrs E were delighted to have achieved their aims without remodelling their bathroom, and saved a considerable amount of money too!